This is one of the most beautiful golfing resorts, with 2 championship courses, this Mountain Course and Lake Course. Sitting 2,000 meters (6,500 ft.) above sea level, the Mountain course at Spring City Golf & Lake Resort has a year round spring-like climate with a huge and beautiful lake creating a perfect backdrop. I personally think that the goodness of layout is not only one of the best in China but in Asia. Relatively generous fairways allow you to let loose with your driver, but a lot of strategically placed sand bunkers and grassy hollows demand precise approach shots and the large, seriously contoured greens make for challenging putting. The surrounding superb views coupled with the lovely curves of the fairways and greens across the course, which is unique to Nicklaus designed courses, create an artistic beauty. The course conditions are excellent: the greens are fast and the fairways are like carpets. A long, gentle dogleg to the left with a generous fairway. You should drive to the right to give you a much better angle of approach, avoiding the deep bunkers guarding the left front side of the green which is elevated a little. A sharp dogleg to the left. A series of bunkers, as much as 50 yards long, guard the left corner of the dogleg, so the layout does not allow you to take a short cut easily. The green is guarded by a naturally wooded hillside and two bunkers on the left. A　beautiful hole with a drive over a lake. The lake crosses the entire width of the fairway and a carry of 240 yards is needed to clear the right side of the lake to the fairway. The fairway is tight and bush on the left and the creek on the right come into play. The green is big and has a severely contoured putting surface, so you might have 3 putts if your ball is far from the pin. A picturesque par 3 with a peninsula green. The tee is elevated and the distance is relatively short, but the green is surrounded by water and the prevailing wind affects your shot, so it gives you some pressure. A gentle dogleg to the left with the downhill second & third shots. The second shot must be strategically placed as a series of bunkers down the middle split this into a double fairway. Going left will leave an easier chip for the third shot, but going right to the wider part of the fairway will force you into a harder approach over deep bunkers. A beautiful gentle slight uphill par 5. Bunkers are well placed. You should avoid the deep bunkers guarding the front left of the green. A relatively long par 3 over a lake. You need to hit an accurate shot because the lake runs down the entire right side of the hole and bunkers guard the left side of the green. You can also enjoy there are pretty cottages behind the green. The longest hole on the course. The fairway is tight and the bunkers about 120 yards off the green come into play for the second shot, so careful planning is needed. The third shot is downhill. The lake behind the green looks really beautiful. A par 3 with a spectacular view of the countryside. The narrow, double-tiered green is well guarded by bunkers on the left and hollows on the right. The elevated tee gives a good view of the numerous bunkers which meander through the hole and of the other hazards. The fairway has strong undulations sloping from the front left to the back right. The tee shot is intimidating since there is an OB on the right, which makes fairway to look tighter. The green is narrow sideways and strongly contoured, so putting is difficult if your ball is far from the pin. A very long “signature hole”. This hole was selected as one of the best 500 holes in the world by 2000’ s poll of US Golf Magazine. The approach shot is extremely difficult. A long iron or a fairway wood must carry over the intimidating ravine that runs 10 yards short of the elevated green. If in any doubt about reaching it in 2, laying up short of the ravine is the safe option. It takes about 45 minutes from Kunming Airport by car. The altitude of 2000 meters (6500 ft.) above sea level adds some 10% distance to your driver. The hotel adjacent to the club is comfortable and you can enjoy a resort life. Beautiful flowerbeds with various colors are placed on sides of all tees; players can understand why Kunming is called “ the flower capital”. Caddies were well trained and they fixed green divots as soon as they found them. Also, employees who are not caddies put sand, the same color as the green, on the divots carefully through their fingertips, which was very impressive. This is a secret to maintaining the course in top condition. I have played twice, two years ago, Aug. 2002, and this time, and the course conditions were excellent. However, my friend who played in Aug. 2004, said that the conditions then were not that great. 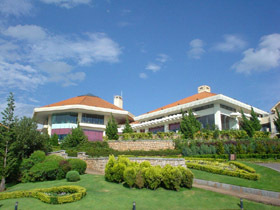 This golf resort is often written about by many Asian golf magazines. In August, holidays and the best season for Kunming’s pine mushrooms coincide, so too many players tend to go there and it might affect adversely the course maintenance sometimes. The other Jack Nicklaus designed courses in China are Chung Shan Hot Spring (中山溫泉)GC – Jack Nicklaus Course, Pine Valley International (華彬國際)GC, Shanghai Links (上海林克司) G&CC, Palm Island (棕櫚島) GC, Wuyi Fountain Palm (江門五邑蒲蔡) GC, Hangzhou West Lake International (杭州西湖國際) G&CC, Suzhou Sunrise (蘇州中興) GC, Nanhu (南湖) GCC, Mission Hill (觀蘭湖)GC – World Cup Course.